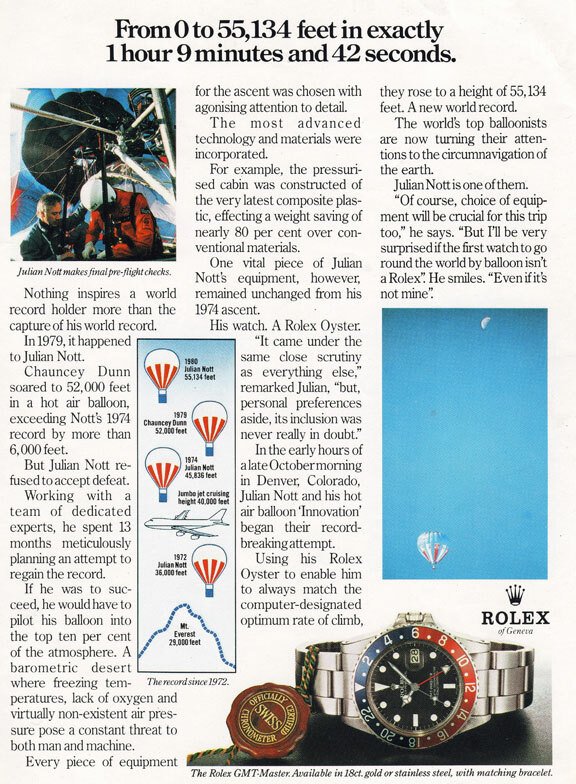 Julian Nott was a founder of the modern ballooning movement and one of its most creative and innovative exponents. As of 2017 he had broken 79 World Ballooning Records, and 96 British Records, including exceeding 55,000 feet in a hot air balloon. His records span many classes – hot air, helium, super pressure and combination balloons – and encompass altitude, distance and time aloft. Some of the world records have stood for more than 30 years “The quality of a records can be judged by how long it stands.” Nott was the only person in the world to hold a pressure balloon rating. 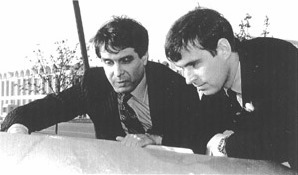 During his long and extraordinary career Nott undertook a number of unique projects. He designed and constructed the first ever hot air balloon with a pressurized cabin, which Nott piloted to a world record altitude and which today is much copied. Other ballooning achievements include the first crossing of the Sahara Desert ; the first crossing of Australia; crossing the Alps; and piloting the world’s first solar balloon across the English Channel. Nott also designed, built and piloted the Nazca Prehistoric Balloon, using only methods and materials available to the Pre-Inca Peruvians a thousand years ago. Nott was the first person to fly a “pumpkin” super pressure balloon. His concept is currently being developed by NASA as the “ULDB” for scientific applications; see “First Crossing of Australia”. Nott holds US Patent 6,182,924 for an entirely new kind of balloon using cryogenic helium see “Design” page. 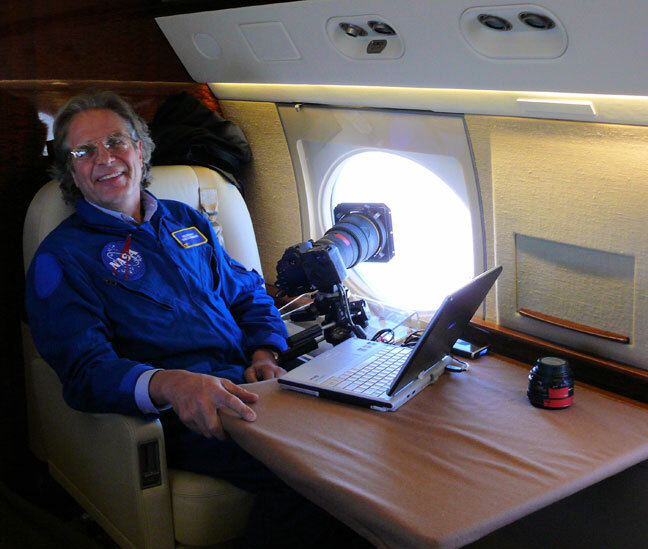 The importance of Nott’s work has been recognized by inclusion in some of the world’s most prestigious museums, including the Smithsonian Air and Space Museum, where one of his balloon cabins is on permanent exhibition, New York’s Museum of Natural History, NASA’s Johnson Space Center Houston and in the permanent collection of the Royal Air Force Museum, London. See the “Museums” page. Nott was a senior scientific consultant to both commercial and academic/government agencies including, NASA JPL, The European Space Agency, Google X, and the Loon Project. He contributed to JPL’s efforts to launch balloons for space exploration to Titian and Venus for over 10 years and conceived, designed and built the first Titian flight simulator. In it he flew a model balloon at the lowest temperature a balloon has ever flown, 320 degrees below zero, a temperature assumed to be present on the surface of Titian. 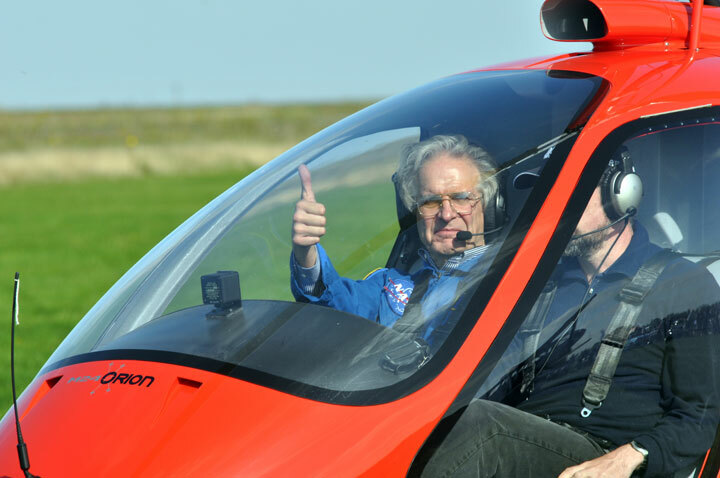 Nott was the Senior Balloon Consultant for Alan Eustace’s successful world record altitude sky dive in 2014. He was a consultant on blimps for six Olympic Games, used for security and surveillance. In 2016 he worked on unique, long duration balloons which, being more cost effective, were used at all 4 venues in the Brazil games. A sought after speaker and writer, Nott, a scientist and a design engineer was the subject of four full-length TV documentaries. He contributed to a wide variety of newspapers and magazines including “The New York Times”, “The Economist” and London’s “Sunday Express” as well as scientific journals including COSPAR’s highly prestigious “Advance in Space Science”, “The Proceedings of The Royal Institution” and US Air Force technical conference papers. His lecturers on Intellectual Courage received rave reviews and provided inspirational examples for those attempting to make a difference in the world, in all walks of life. Nott has advised on all aspects of lighter than air flight for a wide range of non-scientific projects, including commercial advertising, TV and Motion Picture Films. Educated at Epsom College, Nott held a Master’s Degree in Physical Chemistry from Oxford University. Following graduation, Nott worked in Bangladesh with The British Voluntary Service Overseas, the British equivalent of the Peace Corps. He was an honorary Life Member of the Governing Body of St. John’s College, Oxford, a Senior Member of the American Institute of Aeronautics and Astronautics and Honorary Secretary of the Institute’s Scientific Balloon Systems and Technology Committee, a Fellow of the Explorers Club and founder of the Club’s Technology Committee, a Fellow of the Royal Institute of Navigation and the Royal Geographical Society and a Freeman of the City of London. For twelve years, he was a member of the Council of the Royal Aero Club (Patron H.M. The Queen; President, H.R.H. The Prince Andrew) and has been Chairman, Vice Chairman and Secretary of The British Balloon and Airship Club. 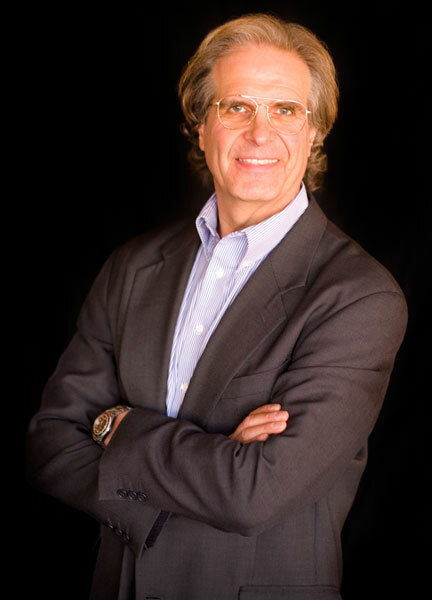 Nott serves on several prestigious corporate boards and advisory committees such as Caltech’s Keck Institute for Space Studies and has a specialist appointment to the University of California at Santa Barbara, whose faculty includes five Nobel Prize winners. Nott was born in Bristol, England, and is a United Kingdom citizen: he also held United States Citizenship. He held a license for all types of balloons with a commercial rating, an instructor’s rating, a super-pressure rating, a night rating; an unrestricted RT license; a parachuting “A” license; and an International (FAI) Sporting License. Among his many long term commercial project sponsors were Rolex Watches and Moet & Chandon Champagne. Nott appeared in several Rolex advertisements and was the recipient of the Rolex Award for Enterprise, honoring extraordinary individuals who possess the courage and conviction to take on major challenges. Nott resided in Santa Barbara, California with his long-time love, artist Anne Luther. the X-Prize for the first private flight into space. pressurized balloon cabins to H.R.H. Prince Andrew. 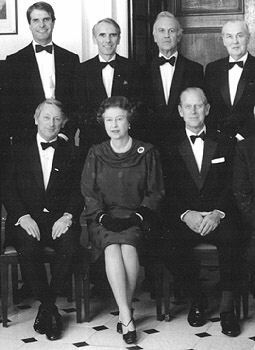 Nott (upper left) with H.M. Queen Elizabeth, H.R.H. Prince Philip and members of the Council of the Royal Aero Club. H.R.H. 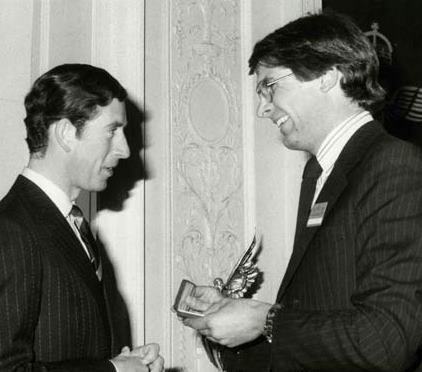 Prince Charles presents Julian Nott with one of the most prestigious international aviation awards, The Gold Medal of Britain’s Royal Aero Club.